Canvassing in Morrell Park on a chilly Saturday, Phylicia Porter knocked on a lot of doors before finding people like cable company worker Michael Livingood who was happy to talk. “I sit on my porch and watch them sell their drugs right there where you’re standing,” he complained, describing stray bullets hitting his car, drug paraphernalia on his back steps and more. 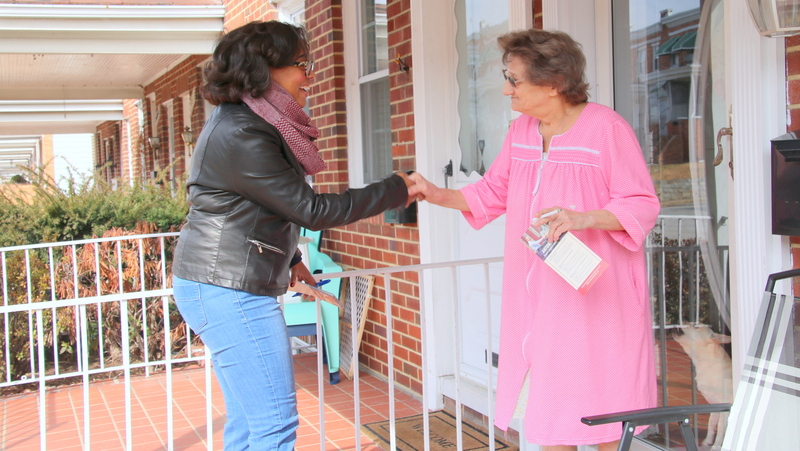 Told that she was working his Southwest Baltimore neighborhood because she is running in the June 26 primary for the 40th District Democratic Central Committee, Livingood paused. • First, they have to explain what central committees are. • Then, they have to make the case that by landing a spot there they would make a difference. “People don’t believe their vote counts. That’s what my students think,” said Steven T. Johnson, a Park Heights community leader, city school teacher and Democrat who is also running for 40th Central Committee. He and the other candidates in the group have the enthusiasm and social media chops to convince young voters to come to the polls, said Johnson, 30, who has sponsored a successful winter coat drive in his community for the last five years. The group, which has been meeting over the past year to bond, trade tips and share resources, doesn’t have a name. It also doesn’t have a formal platform, though members tend to be young and progressive. Some don’t mince words about their view of Baltimore’s Democratic Party as a complacent clubhouse clogged with insiders who are out of touch with the average citizen. “It’s hard to fly the Democratic flag when you look at City Hall and see people like Catherine Pugh and some of the actions they have taken,” said Eric Stephenson, a project manager for a local construction company who is running for a Central Committee seat in District 44-A. Stephenson cites Pugh’s veto of the $15 minimum wage bill (“That was a huge disappointment for Democrats”) as one of the reasons for disillusionment with the party. The process of building this progressive farm team has taken effort. He and others in the group have been canvassing, holding fundraisers and dropping in on local community association meetings for months. Several completed the new candidates’ course offered by Emerge Maryland to increase the number of Democratic women candidates from diverse backgrounds. 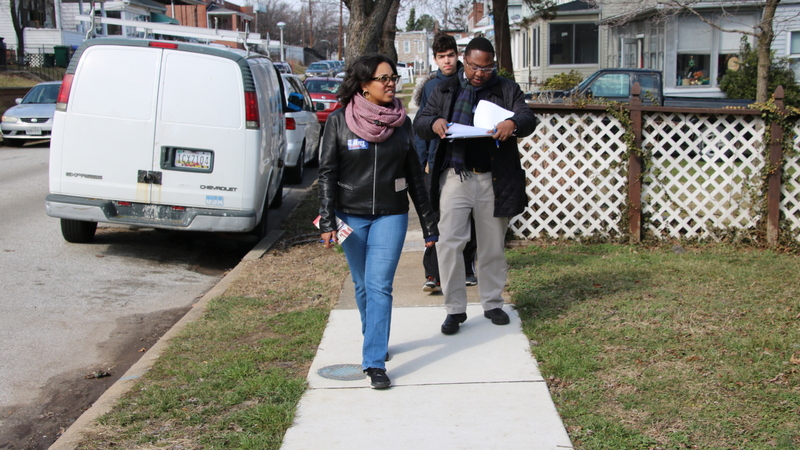 “I’ve been out every weekend since the summer, rain or shine,” said Porter, 30, barreling down the Morrell Park street with the field director and two volunteers supporting Del. Antonio Hayes, Senate candidate in the 40th District. The candidates hope their high energy stands in contrast to the low-voltage performance of the existing central committees, says Ben Smith, another 40th District candidate and one of the group’s early organizers. “Either Baltimore Democrats Revamp our Central Committee, Or We Invite Hogan Repeats,” was the title of the Medium piece Smith wrote on the subject, a reference to the “blue” state of Maryland electing a “red” governor, Republican Larry Hogan, in 2014. That was the year turnout in the primary in Baltimore was an anemic 36%. It was also the year, Stephenson recalled, that only two people ran for the seven available seats in District 44-A, leaving the other five spots vacant, filled later by the committee itself. Other signs of weakness at the central committee level, members of this group say, are even more embarrassing. 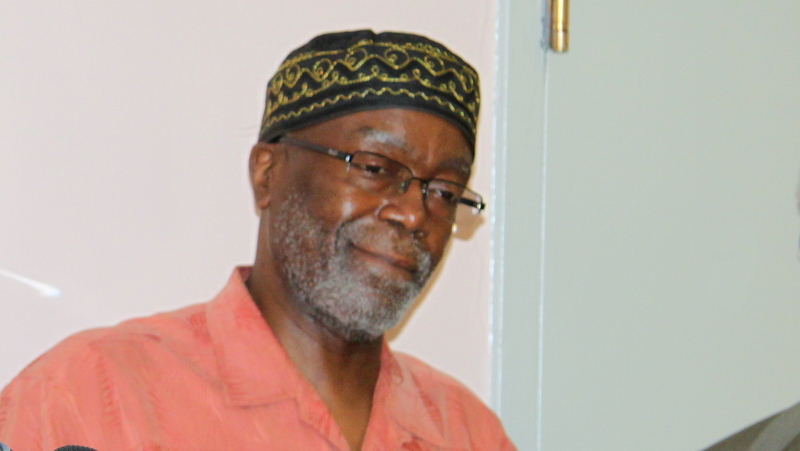 Many point to tarnished officeholders like Sen. Nathaniel T. Oaks of West Baltimore’s 41st District. When a Senate vacancy opened up there last year, the local central committee’s choice to fill it was Oaks – a member of the House of Delegates who had left the legislature in 1989 after being convicted of stealing thousands of dollars from his campaign account. (Voters sent him back to Annapolis in 1994.). Now another cloud hovers over the 71-year-old. “Oaks is a good example of the Democratic Party having missed an opportunity to refresh itself and not get behind candidates with a pattern of compromised behavior,” Smith said. Changing the rules in Baltimore to prohibit people who already hold elected office from sitting on central committees would help make them less of an insiders club, several of the new crop of candidates said. “The way Baltimore is currently operating seems to be more about protecting incumbency than engaging the electorate or building the party,” said Mitchell, director of Maryland Out of School Time Network and a resident of Mt. Washington. The 41st District where she’s running is a good example of the insider phenomenon. Its central committee not only includes Sen. Oaks, but Rochelle “Rikki” Spector, who locked up a City Council seat (that she inherited from her late husband) for nearly four decades. Also sitting on the 41st Committee? Spector’s successor, Councilman Isaac “Yitzy” Schleifer, elected in 2016. West Baltimore’s 40th District is also held up as a poster child for incestuous Baltimore politics. Three generations of one political family sit on that central committee: longtime city councilmember Agnes Welch (1983-2010), her son William A. “Pete” Welch (2011-2016) and her granddaughter Tiffany Welch. 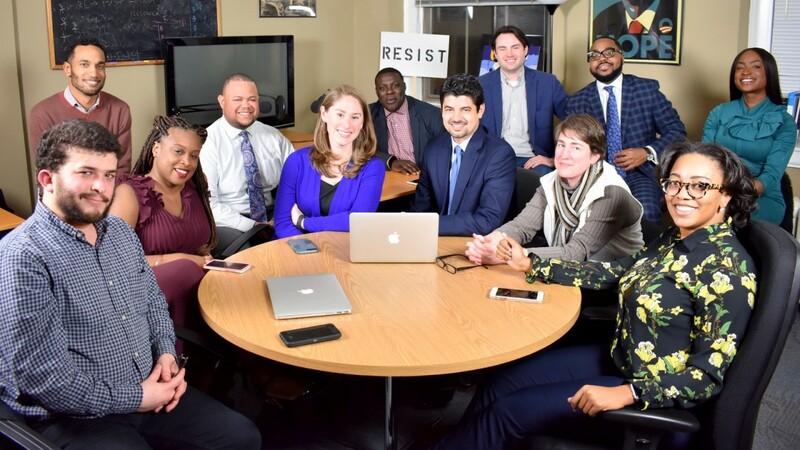 This is the group that almost gave Baltimore another indicted state lawmaker. A month after the committee named Gary Brown Jr. to fill a vacancy in the House of Delegates – and just days before he was to be sworn in – Brown was indicted for election law violations. In May, Brown, who works for Catherine Pugh at City Hall, pleaded guilty to two counts of making illegal campaign contributions. Brown is still listed as a member of the central committee. • A labor leader who led the $15 minimum wage fight (Ricarra Jones, 41st ). • A 25-year-old advocate of women’s rights who is pursuing a graduate degree at the University of Maryland School of Social Work (Paris Bienert, 46th). • A community organizer and Anglican priest (Steve Holt, 43rd). • A former Peace Corps worker who has served on the Maryland Democratic Party’s Latino Leadership Council (Alex Garcia, 43rd). Some have been inside city city government, like City Council staffer Gabriel Stuart-Sikowitz (46th), while others, like Antoinette Rucker (41st), an advocate for the homeless, have leaned more towards community organizing. “I just got mad as hell six years ago about what was happening in Baltimore – the lack of community engagement, of accountability, of transparency,” said Porter, who works on health policy for a federal agency. They found each other through chance and networking, said Johnson, who heard about the group when Smith brought students from the University of Maryland School of Law to help out at his winter coat drive. An unusually large number of people are running for central committee in Baltimore this year – 102 in 2018, vs. 81 in 2014 – not all of them attending the meetings organized by Smith and Stephenson. Others include four members of the city’s Orthodox Jewish community who are running as a slate in the hotly contested 41st. Also running in that district is criminal justice reform advocate and Lazarus Rite founder Christopher Ervin, who has been been advocating for the needs of returning citizens and other issues. Asked about his priority issues, Johnson cites “education and community,” speaking passionately about the need to establish kindergarten literacy programs and attack vacancy and blight. 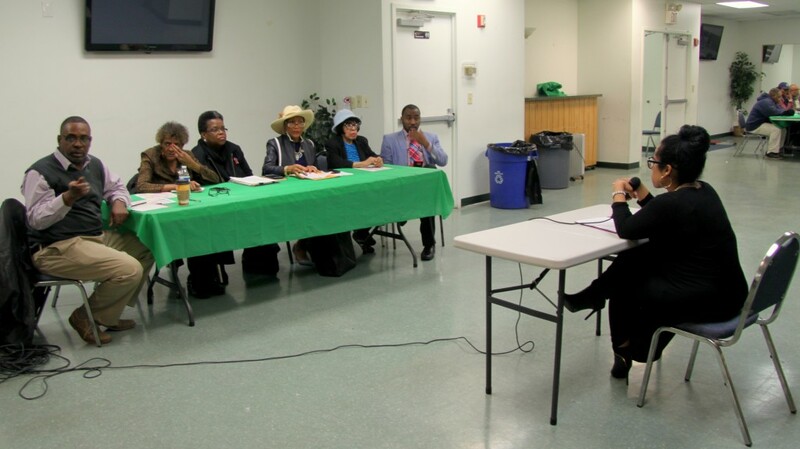 “Rebuilding communities that look-like war-torn cities, helping people get jobs with not just wages but living wages – we’ve got to start there,” said Johnson, who serves as president of the Pimlico Terrace Association. 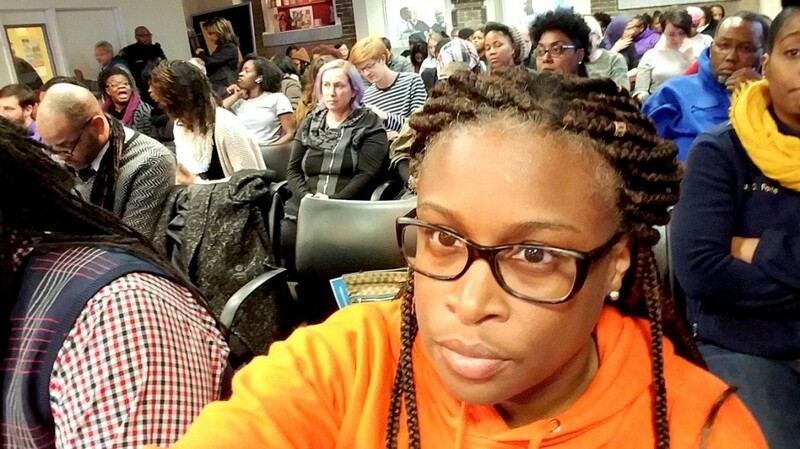 Another high-energy member of the group is education equity advocate Khalilah M. Harris, a city school parent and former Obama Administration official who is running for the 43rd District Central Committee. “We can’t wait for you to tell us what’s going to happen any further because you all don’t seem to have a level of urgency for our children,” Harris said in January at a school board meeting held after students returned from winter break to schools with broken boilers and cold, flooded classrooms. As unsparing as her analysis is about Baltimore’s troubles, Harris told The Brew she remains upbeat about the possibility of change.